Igor has changed little over the afternoon and evening. After Igor's rapid deepening it has now leveled off. There may have been a very slight weakening over the past few hours with the eyewall warming. Note: our estimate of distance from the Leewards is different from the hurricane center's estimate due to using a differernt reference point. As of 9 pm edt / ast hurricane Igor was centered near 17.7° N / 50.8° W or about 700 miles east of the northeastern Leewards. Top sustained winds are estimated at 150 mph (NHC 150 mph 5 pm advisory). Movement is west at 10 mph. Pressure estimated at 933 mb by the hurricane center. Forecasts generally take Igor west, then west northwest eventually recurving about 200-300 miles before the Leewards around Wednesday / Thursday. The more reliable models have Igor turning about 200 miles east of Bermuda late Friday into Saturday. It is too early to know what effects Bermuda may receive. Hurricane Igor is beginning its turn well east of the Leewards. Keep in mind that large swell is still possible in the Lesser Antilles, generated by Igor's powerful winds. It does appear that cloud tops have warmed slightly in the eyewall so we (and the hurricane center) have dropped winds a little. Igor may strengthen and weaken some over the next 36 hours with eyewall replacement cycles. After this gradualy weakening will start as wind shear picks up. Igor still may be a hurricane at Bermuda's latitude several days from now. As of 7 am edt / ast hurricane Igor was centered near 18.2° N / 51.9° W or about 645 miles east of the northeastern Leewards. Top sustained winds are estimated at 140 mph (NHC 135 mph 5 am advisory). Movement is west northwest at 13 mph. Pressure estimated at 945 mb by the hurricane center. Forecasts start to turn Igor northwest today, then recurve it about 350 + miles east of the Leewards by Thursday. After this, Igor moves more north northwest. The models have been jumping around a little on the placement of Igor by the time it reaches the latitude of Bermuda. Once again they are fairly close to Bermuda by Saturday night. It is too early to know what effects Bermuda may receive. Igor's satellite presentation looks nearly as impressive as yesterdays. Because of this we are keeping winds up at 140 mph. The main difference is that the eyewall is not as thick on the northwestern quadrant. As of 2 pm edt / ast hurricane Igor was centered near 18.8° N / 52.8° W or about 575 miles east of the northeastern Leewards. Top sustained winds are estimated at 140 mph (NHC 135 mph 11 am advisory). Movement is northwest at 9 mph. Pressure estimated at 945 mb by the hurricane center. Forecasts start to turn Igor northwest today, then recurve it about 350 + miles east of the Leewards by Thursday. After this, Igor moves more north northwest. The models have been jumping around a little on the placement of Igor by the time it reaches the latitude of Bermuda. Once again they are fairly close to Bermuda by early sunday morning. It is too early to know what effects Bermuda may receive. 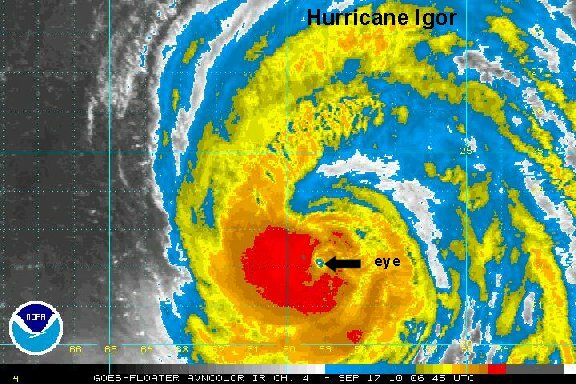 Cloud tops have warmed in the eyewall indicating that Igor is weakening some. We are actually 15 mph lower than the hurricane center's estimate as the presentation on the I.R. satellite is looking more ragged than earlier. The eye is being obscured by clouds also. You can do a simple comparision of yesterday's satellite imagery and see that Igor is not nearly as well defined. 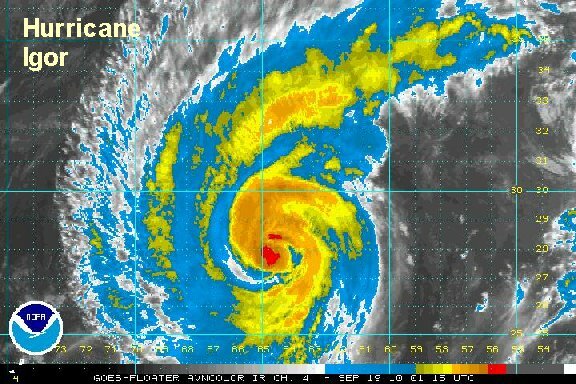 Last night the hurricane center had winds up to 155 mph or just under cat 5 strength. We think that the strength has dropped considerably since that time. 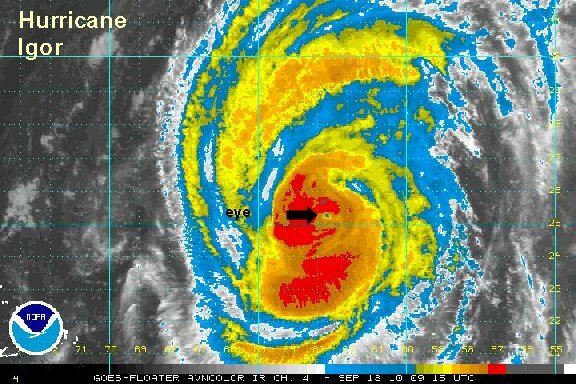 As of 7 am edt / ast hurricane Igor was centered near 19.7° N / 54.8° W or about 1065 miles southeast of Bermuda /450 miles east northeast of the northeastern Leewards. Top sustained winds are estimated at 130 mph (NHC 145 mph 5 am advisory). Movement is northwest at 10 mph. Pressure estimated at 935 mb by the hurricane center. Igor will be making it closest pass to the Leewards over the next 24 hours - about 350 + miles east of the Leewards. After this, Igor moves more north northwest. Forecast models have been consistently placing Igor in the vicinity of Bermuda by Sunday. It is still too early to know what effects Bermuda may receive. The effects will be vastly different if Igor is still a major hurricane or a minimal hurricane. 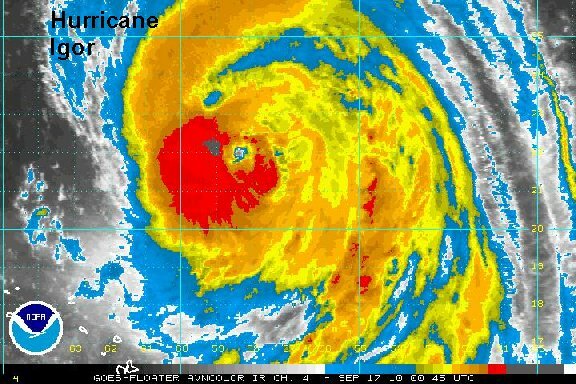 For residents and visitors to Bermuda sit tight and keep an eye on the situation. The hurricane center dropped thier winds on the 11 am edt advisory to closely match ours. It appears now that the eyewall is expanding and cooling allowing for the next phase of strengthening to occur. 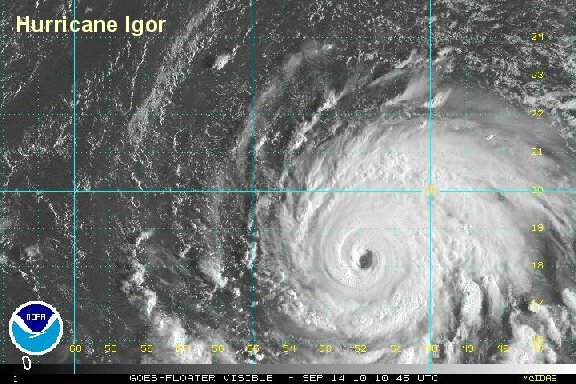 Igor nearly made a cat 5 last night, it may give another run at it this evening. 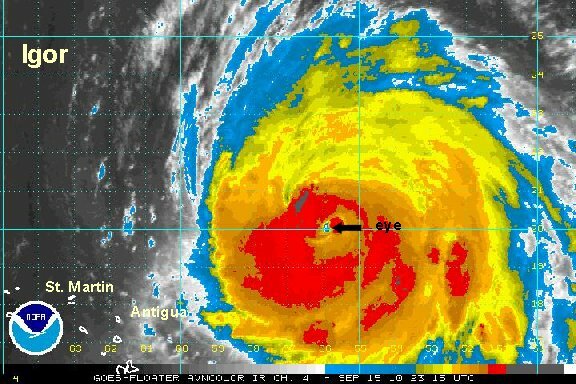 As of 1 pm edt / ast hurricane Igor was centered near 19.9° N / 55.1° W or about 1040 miles southeast of Bermuda / 535 east northeast of St. Martin / 460 northeast of Antigua. Top sustained winds are estimated at 140 mph (NHC 135 mph 11 am advisory). Movement is northwest at 8 mph. Pressure estimated at 942 mb by the hurricane center. Igor will be making it closest pass to the Leewards over the next 24 hours - about 400 + miles east of the Leewards. After this, Igor moves more north northwest. Forecast models have been consistently placing Igor in the vicinity of Bermuda by Sunday. It is still too early to know what effects Bermuda may receive. The effects will be vastly different if Igor is still a major hurricane or a minimal hurricane. For residents and visitors to Bermuda sit tight and keep an eye on the situation. Satellite imagery shows clouds cooling in the eyewall. Because of this, we have nudged winds up a little. 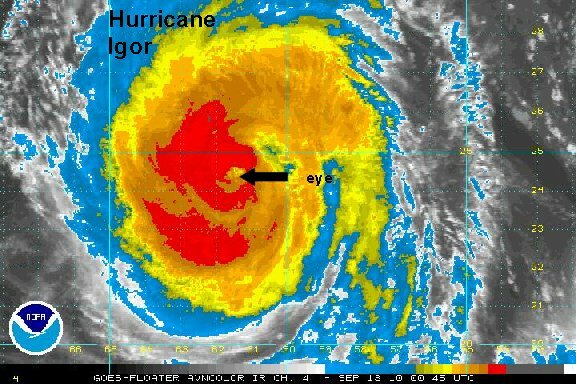 Igor is also growing in size and is a large hurricane. Igor may try to make cat 5 again tonight, similar to last night. 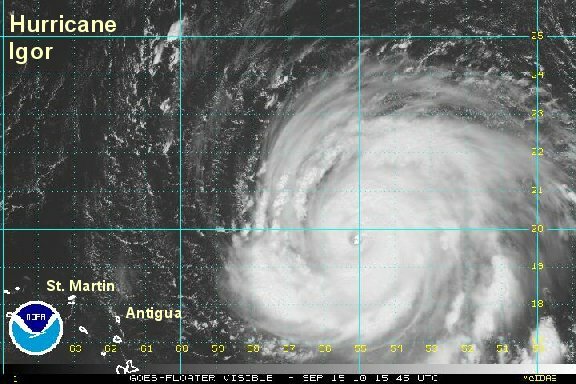 As of 8 pm edt / ast hurricane Igor was centered near 20.2° N / 56.0° W or about 995 miles southeast of Bermuda / 490 east northeast of St. Martin / 415 northeast of Antigua. Top sustained winds are estimated at 145 mph (NHC 135 mph 5 pm advisory). Movement is west northwest at 8 mph. Pressure estimated at 942 mb by the hurricane center. Igor is at closest pass to the Leewards at about 400 miles northeast of the Leewards. After this, Igor moves more north northwest. Forecast models have been consistently placing Igor in the vicinity of Bermuda by Sunday. It is still too early to know what effects Bermuda may receive. The effects will be vastly different if Igor is still a major hurricane or a minimal hurricane. For residents and visitors to Bermuda sit tight and keep an eye on the situation. 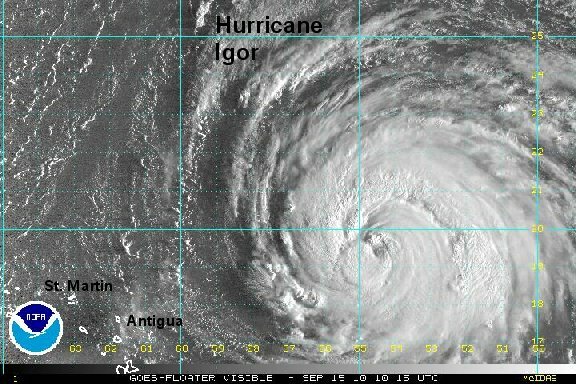 Igor remains a large hurricane. 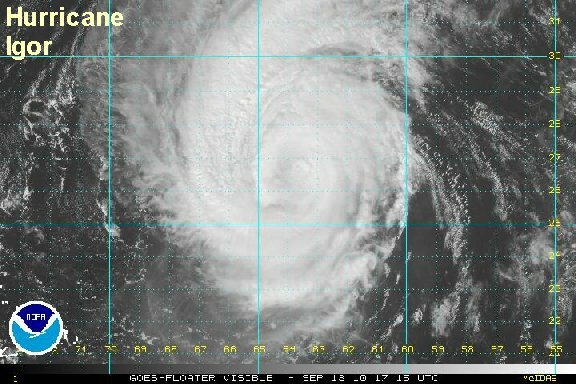 It has slowed down, delaying the time that it will be near Bermuda late this weekend. The top sustained winds are estimated at 145 mph. Seas are predicted at 47 feet by NOAA under the eyewall. Satellite imagery shows what may be a little dry air northwest of Igor. 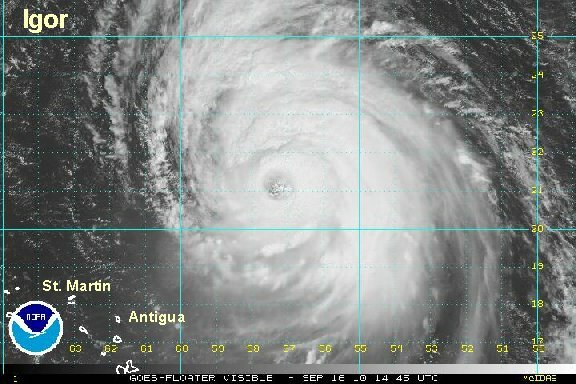 As of 7 am edt / ast hurricane Igor was centered near 20.8° N / 56.8° W or about 935 miles south southeast of Bermuda / 450 east northeast of St. Martin / 390 miles northeast of Antigua. Top sustained winds are estimated at 145 mph (NHC 145 mph 5 am advisory). Movement is west northwest at 7 mph. Pressure estimated at 929 mb by the hurricane center. Igor is at closest pass to the Leewards at about 400 miles northeast of the Leewards. After this, Igor moves more north northwest. Forecasts call for Igorto be in the vicinity of Bermuda by late Sunday evening. It is still too early to know what effects Bermuda may receive. The effects will be vastly different if Igor is still a major hurricane or a minimal hurricane. For residents and visitors to Bermuda sit tight and keep an eye on the situation. Igor has not changed much since this morning. It continues to fight off some dry air to the northwest side of the eyewall. For a couple of hours the eyewall cooled on the northwest side, but that chance for strengthening was short lived. Swell under the eyewall is still predicted at 45-50 feet with some higher waves by NOAA. As of 2 pm edt / ast hurricane Igor was centered near 21.5° N / 57.8° W or about 860 miles south southeast of Bermuda. Top sustained winds are estimated at 145 mph (NHC 140 mph 11 am advisory). Movement is northwest at 7 mph. Pressure estimated at 934 mb by the hurricane center. Igor is at closest pass to the Leewards at about 400 miles northeast of the Leewards. After this, Igor moves more north northwest. Forecasts call for Igor to be in the vicinity of Bermuda by Sunday night. It is still too early to know what effects Bermuda may receive. The effects will be vastly different if Igor is still a major hurricane or a minimal hurricane. For residents and visitors to Bermuda sit tight and keep an eye on the situation. Igor is fighting a little shear. The north side of the circulation is not nearly as impressive on the satellie imagery. If wind shear dies down some slight strengthening may occur before Igor moves progressively over cooler water in several days. 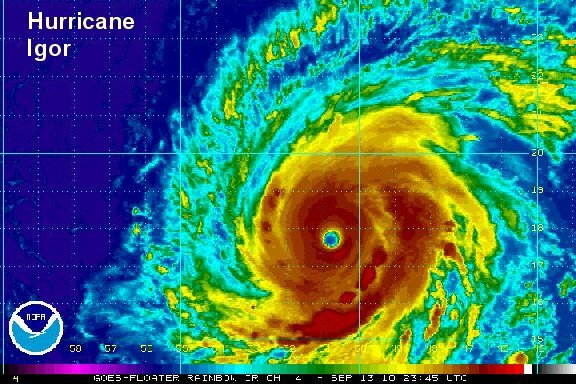 Usually the cooler water and stronger winds aloft weaken a hurricane as it gets to latitudes farther north. 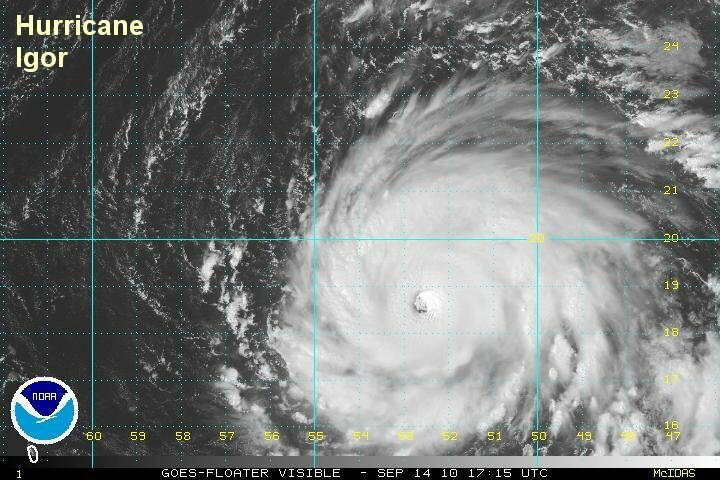 As of 10 pm edt / ast hurricane Igor was centered near 22.1° N / 58.8° W or about 795 miles south southeast of Bermuda. Top sustained winds are estimated at 130 mph (NHC 125 mph 5 pm advisory). Movement is northwest at 8 mph. Pressure at 940 mb by therecon. Igor will begin to move north north west soon. Forecasts call for Igor to be in the vicinity of Bermuda by Sunday. It is still too early to know what effects Bermuda may receive. The effects will be vastly different if Igor is still a major hurricane or a minimal hurricane. 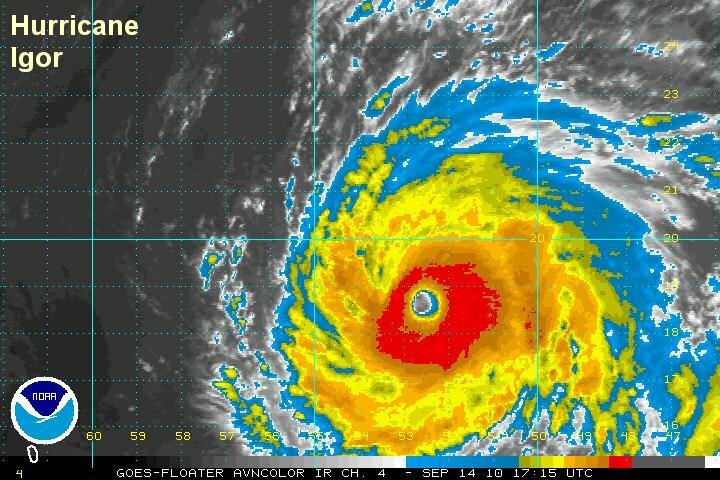 For residents and visitors to Bermuda sit tight and keep an eye on the situation. It appears that Igor is slowing a bit as the anticipated north northwest turn is about to occur. 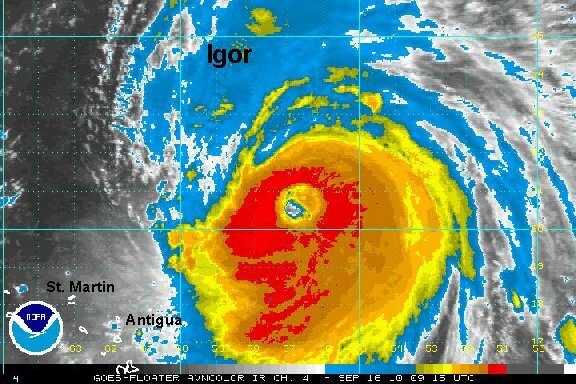 Igor remains a large and dangerous cat 3 hurricane. Large swell can still be expected in the Leewards and Bermuda - about 10-12 feet right now. Bermuda looks to see very large swell as the hurricane approaches. Right now swell is estimated at 45-50 feet under the eyewall with higher seas possible. 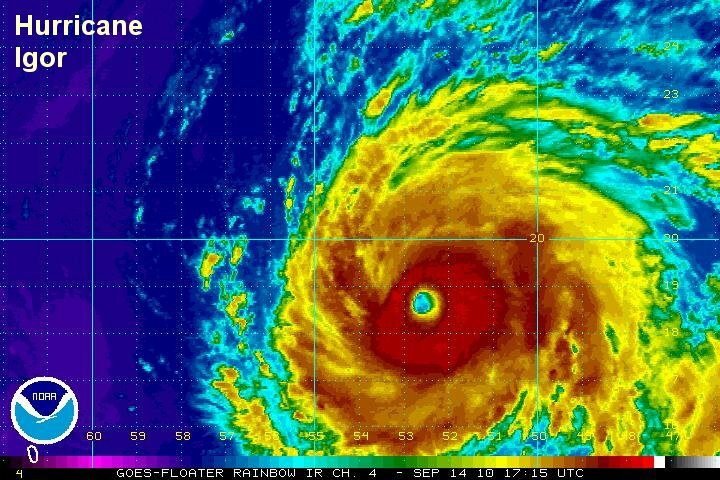 As of 7 am edt / ast hurricane Igor was centered near 22.4° N / 59.4° W or about 760 miles south southeast of Bermuda. Top sustained winds are estimated at 125 mph (NHC 125 mph 5 am ast advisory). Movement is northwest at 8 mph. Pressure at 935 mb by the recon. Forecasts call for Igor to be in the vicinity of Bermuda by Sunday evening. It is still too early to know what effects Bermuda may receive. It looks like Igor will be a cat 2 or 3 hurricane near Bermuda. It is still about 2 1/2 days away from the time of its closest approach to Bermuda. We should have an even better idea on Igor's strength by tomorrow. The latest recon shows some weakening as Igor continues its slow steady track toward Bermuda. Seas are still near 50 feet under the eyewall and swell will continue to build near Bermuda. As of 3 pm edt / ast hurricane Igor was centered near 23.5° N / 60.8° W or about 655 miles south southeast of Bermuda. Top sustained winds are estimated at 115 mph (NHC 115 mph 2 pm ast advisory). Movement is northwest at 9 mph. Pressure at 947 mb by the recon. Forecasts call for Igor to be in the vicinity of Bermuda by Sunday evening. It is still too early to know what effects Bermuda may receive. It looks like Igor will be a cat 2 or 3 hurricane near Bermuda. It is still a little over two days away from the time of its closest approach to Bermuda. We should have an even better idea on Igor's strength by tomorrow. Satellite imagery continues to show a slow weakening evidenced by an eyewall that is not that impressive. Wind shear is forecast to ease up over the the next 24 hours so the hurricane center is calling for some restrengthening. We will take a watch and see what happens approach since the current weakening at this point wasn't forecast well by the models. In fact, the models are not that good at predicting weakening and strengthening of a hurricane. Sea swell is still in the 45-50 foot range near the eyewall. If the weakening continues, look for the swell to slowly, but steadily come down. As of 10 pm edt / ast hurricane Igor was centered near 24.8° N / 61.7° W or about 550 miles south southeast of Bermuda. Top sustained winds are estimated at 105 mph (NHC 105 mph 8 pm ast advisory). Movement is northwest at 9 mph. Pressure at 947 mb by the recon. A recon from several hours ago reported a 939 mb pressure, which would indicate significant strengthening. The I.R. 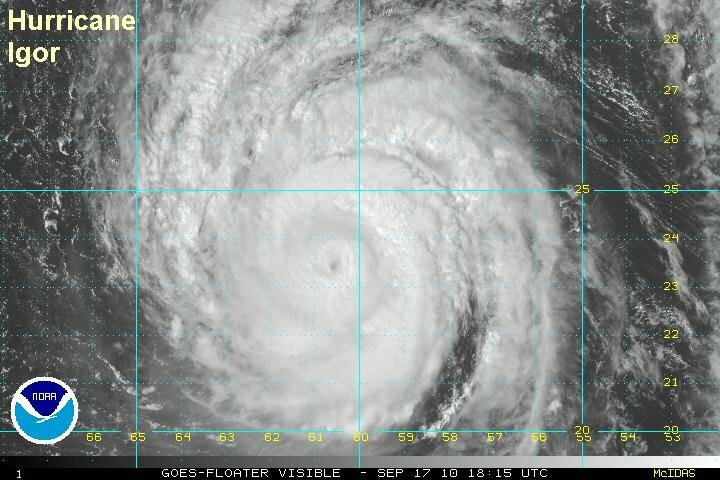 satellite imagery also would seem to back up a stronger hurricane too. Since then, cloud tops have warmed and it it appears the hurricane has weakened some again. The net result - Igor is about the same strength as it was early last evening. The ocean water remains warm and another strengthening phase may take place if the shear does die down again. Seas remain about 50 feet near the eyewall as stated by NOAA. Swell up to about 12-15 feet is now near Bermuda. As of 6 am edt / ast hurricane Igor was centered near 25.3° N / 62.8° W or about 500 miles south southeast of Bermuda. Top sustained winds are estimated at 110 mph (NHC 110 mph 5 am ast advisory). Movement is northwest at 13 mph. Pressure at 939 mb by the recon. Forecasts call for Igor to be in the vicinity of Bermuda by Sunday evening. It looks like Igor will be a cat 2 or 3 hurricane near Bermuda. It is a over a day and a half away from the time of its closest approach to Bermuda. A hurricane hunter recon found a slightly weaker Igor on the last pass. We are in agreement with the huricane center's estimate again. Conditons will start to go downhill in Bermuda tonight as rain bands are only 50-100 miles south of Bermuda. Swell up to about 15-16 feet is now near Bermuda. As of 2 pm edt / ast hurricane Igor was centered near 26.6° N / 64.1° W or about 400 miles south of Bermuda. Top sustained winds are estimated at 105 mph (NHC 105 mph 2 pm ast advisory). Movement is northwest at 12 mph. Pressure at 945 mb by the recon. Forecasts call for Igor to be in the vicinity of Bermuda by Sunday evening. It looks like Igor will be a cat 2 or 3 hurricane near Bermuda. It is less than a day and a half away from the time of its closest approach to Bermuda. The latest recon continues to show a slow methodical weakening of Igor. The first outer squall bands are now over Bermuda with the large rain around associated with the CDO just to the south. Winds are currently 20-25 mph and increasing. Winds will steadily pick up though Sunday. Swell up to about 15-20 feet is now near Bermuda and up to 45 feet near the eyewall. Swell will continue to decrease if Igor's weakening trend continues. It looks like Igor is now moving north northwest. As of 10 pm edt / ast hurricane Igor was centered near 27.9° N / 64.6° W or about 310 miles south of Bermuda. Top sustained winds are estimated at 95 mph (NHC 100 mph 8 pm ast advisory). Movement is north northwest at 14 mph. Pressure at 945 mb by the recon. Forecasts call for Igor to be in the vicinity of Bermuda by tomorrow evening. It looks like Igor will be a cat 1 or weak cat 2 hurricane near Bermuda.